1.Prepare outdoor grill for direct grilling over medium heat. In small bowl, whisk garlic, peanut butter, water, soy sauce, lime juice, 1 teaspoon sesame oil and sugar. 2.Coat chicken with olive oil, 1/4 teaspoon salt and 1/8 teaspoon pepper. Place chicken on hot grill rack; cook, covered, 8 minutes or until internal temperature reaches 165°, turning once. 3.In large skillet, heat remaining 2 teaspoons sesame oil over medium-high heat. Add snap peas and cook 2 to 3 minutes or until tender-crisp; stir in juice, zest and remaining 1/4 teaspoon salt and 1/8 teaspoon pepper. 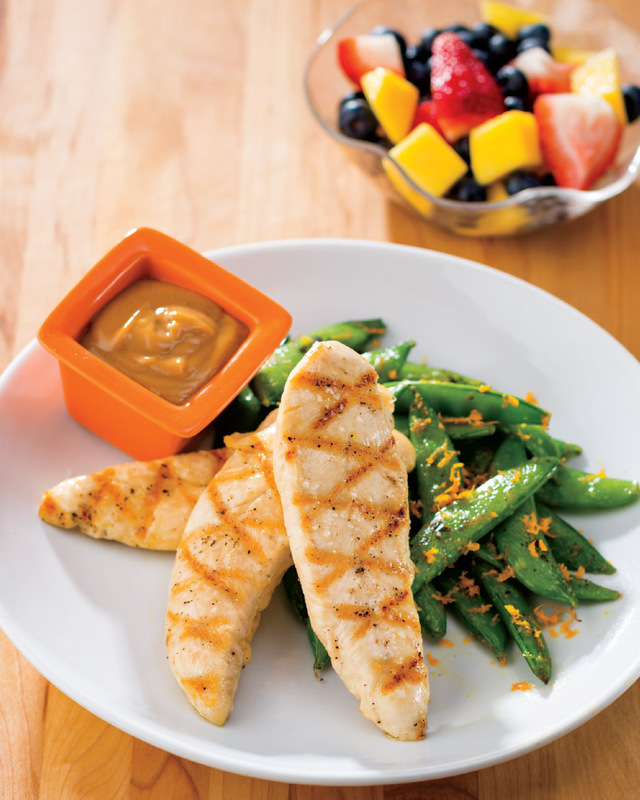 4.Serve chicken with sauce for dipping and snap peas. > Looking to avoid soy or sodium in your diet? Swap a low-sodium soy sauce for coconut aminos.